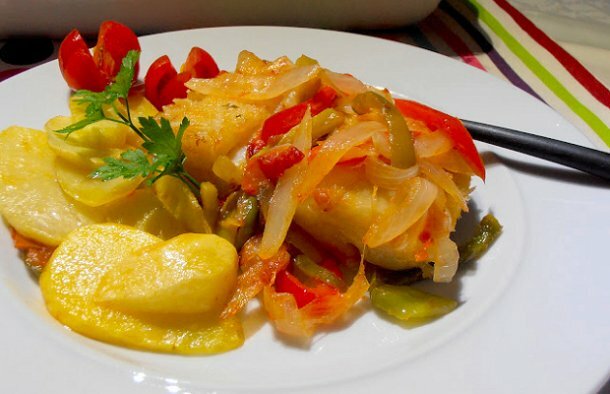 This Portuguese Braga style cod recipe (receita de bacalhau à Braga) is easy to prepare, serve with a mixed salad. Heat the cod in a pan with water, when the water boils, turn off the heat and leave it in the water for 5 minutes. Heat a frying pan with plenty of olive oil, add the bay leaves and two whole cloves of garlic. When the olive oil is hot, add the cod and let it fry. Once it's done, remove and place it in a serving dish and set aside (place it in the oven to keep it warm). Meanwhile, cut the onions and the other 2 garlic cloves in slices and place in the frying pan where you fried the cod and remove the 2 whole garlic cloves and the bay leaves. Add the peppers cut in strips and the tomato cut in pieces. Season with salt and pepper, add the vinegar and cook until the onion is cooked. Fry the potatoes cut into thick slices and place them around the cod. Top with the onion mix and serve with a salad.